The Parish Council has created and manages allotment gardens in the centre of the village of Langton Matravers. There are currently 13 full size plots ( 9m x 27m) and 30 half size plots (9m x 13.5 m). There is presently a waiting list . Plots do regularly become vacant and anybody resident in the Parishes of Langton Matravers or Worth Matravers put themselves on the waiting list by contacting Mary Sparks the Clerk to the Council. SWANAGE RESIDENTS: Although priority will always be given to the local population, due to an historical short fall of local tenants, the Parish Council will grant tenancies to residents of Swanage. Please contact the Clerk for information. Allotments plots are rented out at £70 per year (including all expenses) for a full plot and £35 per year (including all expenses) for a half plot. The Allotments are on land leased from the National Trust and were created by the Parish Council in 2009 with financial assistance from COMMA (The Community Aggregates Fund). This funding was obtained with assistance from the following agencies:- Defra’s Aggregates Levy Sustainability Fund, Dorset Community Action (DCA) and ACRE (Action for Communities in Rural England). In the August 2009 edition of the DORSET magazine there was an article by Edward Griffiths on the Langton Matravers Allotments. This article was one of a series written in which he met people who ‘grow their own’ on the county’s allotments. This article was written soon after the allotment gardens were created and gives a good insight into their early beginnings. 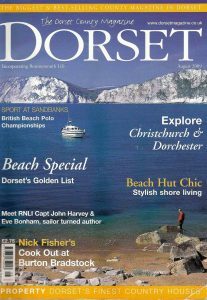 The Dorset Magazine, which is published every month and contains many articles of interest relating to Dorset and the Bournemouth area, have given the Council permission to reproduce this article on this website. There is an active allotment association which all allotment tenancy holders have the right to become members of. The Parish Council encourages membership by paying Product and Public Liability Insurance cover for members and their helpers. More information about the LMAA can be found in our Local Organisations section.